Kristin Westra, 47, was last seen Sunday night, having left her home without her phone, keys, wallet and her car, but she may have been wearing flip-flops. NORTH YARMOUTH (NEWS CENTER Maine) — The husband of a missing North Yarmouth woman says this has been the hardest thing he's ever had to deal with in his life. In an interview Wednesday, Jay Westra told NBC News his wife, Kristin, is the love of his life — "she's perfect for me" — and said he doesn't care about his situation or what other people think or gossip, just the return of Kristin to him and her family. Everything else is secondary, he said. "Kristin, no matter what, come home," Jay Westra said when asked for a message he'd like to send out to her. "We've always taken care of everything, we've solved every problem, we're a team, we will be a team, your daughter loves you, your friends love you, your parents love you, your brother and sister-in-law love you, aunts and uncles, everybody wants you back. There's nothing [sic] there's no problem, no embarrassment, no obstacle, that can't be overcome when you come back." Westra, a pediatric oncology nurse at Maine Children's Cancer Program, which is part of Maine Medical Center's Barbara Bush Children's Hospital, was somber throughout the interview and spoke about what Kristin means to him and the community. When asked about what this has done to his family, he said, "I told my daughter that sometimes adults have stress or worries or anger and, just like she would, sometimes adults need time to think. My daughter sometimes needs to go somewhere to have some time alone to collect her thoughts and figure out what she would need to talk to [sic] about or who to talk about something." Westra said his home's organization was not normal because of some remodeling. "Because of the construction our sort of normal routine has been disrupted. I don’t have a good idea of what she was wearing when she left, my thoughts are guesses, just surmising from what I see that’s left. I truly don’t know if she had a third pair of running shoes which she very well may have, so it’s either a pair of running shoes or a pair of flip-flops that are not here. I don’t know what she’s wearing." "I know that the raincoat she usually wears was in her car," Westra said. "The only thing that was unusual was the garage door. The back entrance was slightly open, about 3 inches, and truthfully, that’s something that the latch catches every once in while and the door doesn't go all the way shut. So that may be a way she left the building. Our front door is noisier, and she may have left the back door, not trying to wake anyone up. She’s a thoughtful person and if we were asleep, she would not want to wake us up." Asked about the possibility Kristin was taken from the home, Westra said, "She is a strong, powerful person and I would’ve heard something. I can’t imagine a scenario where somebody would be able to take her from the house without noise and without a fight." When asked if he had any information about his wife's disappearance, Westra said, "I’ve done nothing to impede the investigation, in fact, I’ve done everything I could to help. I don’t personally care about my situation right now. My situation is secondary, my feelings are secondary. My primary thing is the return of Kristin to me and her family. Everything else is secondary. I don’t care what people think. I don’t care what people gossip. That’s a non-issue, a non-thought to me, I only have one thought." The search for missing 47-year-old Kristin Westra, a mother and teacher, continued Wednesday with better weather aiding searchers. 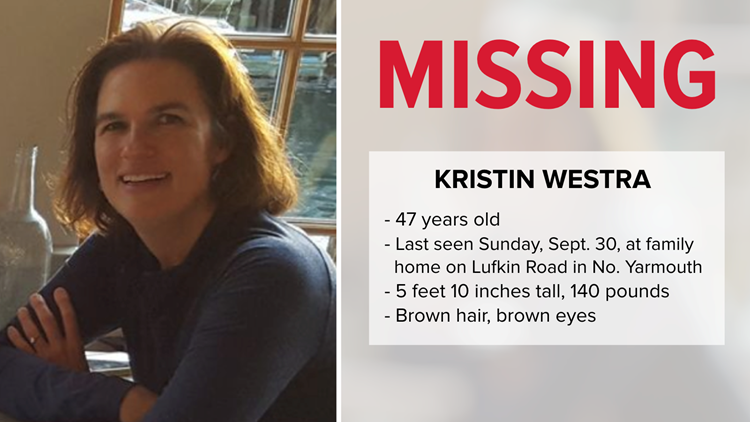 Kristin Westra was last seen Sunday night. According to Eric Rohrbach, Kristin Westra’s brother, she got up around 3 a.m. Monday because she couldn't sleep. Rohrbach said his sister had been under a lot of stress and was dealing with anxiety lately because of work and because she and her husband, Jay, were renovating their house. Rohrbach said when his brother-in-law got up in the morning, his sister was gone. He said she left without her phone, keys, wallet and her car, but she may have been wearing flip-flops. NEWS CENTER Maine learned Wednesday that Westra was an avid runner who would often run barefoot. The search radius for Westra expanded Wednesday to a mile and a half around her home on Lufkin Road in North Yarmouth as authorities ruled out that she was in the area immediately around her home. Game wardens were flying planes to aid in the search of the mother of two. Drones were also searching for the brown-haired, brown-eyed woman along with six canine units which were trying to pick up in Westra’s scent. Authorities said the wind on Wednesday was helping search dogs because they would be able to pick up Westra’s scent from farther lengths. Authorities said they had received more than 100 tips regarding Westra’s disappearance. Several from friends telling police where she liked to run and places she liked to visit. Authorities said they had received some tips of people claiming they saw something "suspicious." Every tip has to be thoroughly followed, and police say that task is daunting. A neighbor's surveillance footage showed Westra returning home from a jog around 6 p.m. Sunday evening but authorities said the footage captured no other images of Westra after the 6 p.m. appearance. Westra also was not on any medications, according to officials. Her husband echoed this in his interview with NBC News, saying, since he's known her, she's only taken ibuprofen. Kristin has brown hair and brown eyes, weighs around 140 pounds, and is 5 feet 10 inches tall. Police are not sure what she was wearing when she disappeared. Anyone with any information is asked to contact the Cumberland County Regional Communications Center at (207) 883-2810, option 2. The 47-year-old from North Yarmouth is a mother of two children and a teacher on Chebeague Island.